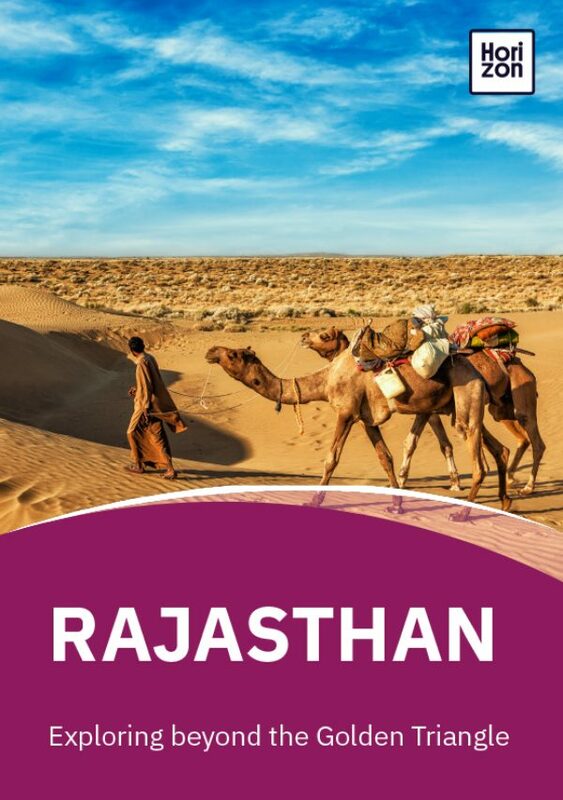 Rajasthan’s capital is postcard picture perfect and is the gateway to all the state has to offer. There are palaces, forts, temples, stepwells, gardens and lakes all waiting to be explored. Jaipur’s Old City is painted in shades of terracotta (Jaipur’s nickname is the Pink City) and its crumbling buildings are awash with history. Founded by Raja Jai Singh II in the 18th century (1727), Jaipur was initially created to supply water to neighbouring Amer Fort. Now a UNESCO World Heritage site, Amer Fort -- along with Nahargarh Fort and Jaigarh Fort -- remains the main attractions of Jaipur. Built in the 10th century and constructed from red sandstone and marble, Amer Fort (also known as Amber Fort), with its elaborate ramparts, opulent palaces and old temples, has been home to royalty since the 16th century. Set over four levels with six separate sections, the fort overlooks Maota Lake. Its palaces -- Sheesh Mahal (Palace of Mirrors) and Sukh Niwas (Hall of Pleasure) -- use fans and fountains to create a cool, calming atmosphere. The Sheesh Mahal is filled with mirrors and pieces of coloured glass inlaid into its walls and ceilings. Built by Maharaja Man Singh in the 16th century for his queen, the palace is supposed to mimic the starry sky. According to legend, one candle was enough to light up the entire palace, causing it to glow and glisten even in the dark. Look out for the marble carved magic flower: seven unique designs including lotus, fish tail, cobra and scorpion, which are unveiled by hiding part of the panel with your hand. The Sukh Niwas is where the king spent time with his queen and concubines. This palace is decorated with paintings of vases in blue, green and yellow, designed to give a peaceful and relaxed atmosphere. This palace is also home to a rudimentary form of air-conditioning, with a channel cut into the ground where cold water would flow, cooling the palace’s temperature. Perched on the hills of Cheel Ka Teela (Hill of Eagles), Jaigarh Fort was built in 1726 by Jai Singh II to protect the Amer Fort. The two forts are connected by a series of underground passageways. Jaigarh Fort is famous for a cannon called Jaivana, which was once the world’s largest cannon on wheels. There are small temples inside the fort and several palaces, including Laxmi Vilas, Lalit Mandir, Aram Mandir and Vilas Mandir. Jaigarh Fort also has a bizarre spot in history. While its water tank might seem ordinary -- three levels, enough capacity to store six million gallons of water -- it is also allegedly the place that Man Singh stored his treasure. In 1977, then Indian prime minister Indira Gandhi ordered a search to look for the Fort’s treasure. After three months, the search was called off -- but at the same time, the Delhi-Jaipur highway closed for three days, prompting rumours of the loot being whisked away in secret. One of the best forts for sunset views, Nahargarh is also believed to be haunted by the ghost of a Rathore prince called Nahar Singh Bhomia. In an attempt to pacify his spirit, you’ll find a small fortress built in his name inside the fort. Nahargarh was built as a royal retreat by Sawai Jai Singh, and it is the beautiful Mahavendra Palace that is its architectural highlight. The palace’s arched entrance is decorated with floral frescos, while inside its courtyard lies nine identical suites, meant for each of his queens. Each suite is two-storied with living quarters, bedroom and kitchen. At the palace’s head lies the king’s palace, complete with decorated doors and frescos. The City Palace complex is one of Rajasthan’s architectural highlights. Its Chandra Mahal is still a royal residence and entry is restricted to the ground floor, which houses the Mahal’s museum and a collection of royal memorabilia. Grand courtyards, lush gardens and monuments dot this architectural masterpiece in the middle of Jaipur’s Old City. Built in the 18th century, the opulent palace includes Mukut Mahal, Maharani’s Palace, City Palace Museum and Shri Govind Dev Temple. Built as an extension to the City Palace, the Hawa Mahal (Palace of Winds) was designed to allow female royals to watch processions without being observed. The palace resembles a collection of beehives, with more than 953 jharokas (windows) with intricate lattice work allowing the wind to cool inhabitants during the summer. Built by Maharaja Sawai Pratap Singh in the middle of the 18th century, the Water Palace is typical of Rajasthani architecture. The palace has five storeys, of which four are under water. It was apparently a summer retreat and a picnic spot where royals gathered to go duck hunting. You cannot enter the palace but you can see it from the banks of Man Sagar Lake. The city was painted pink during the reign of Raja Ram Singh in the 19th century (1876) to welcome the then Prince of Wales, Albert Edward, who later on became King Edward VII. There is even an Albert Hall named after him in the city. An 800-year old living fort, the never-ending sand dunes of the Thar Desert and haunting tales bring the Golden City of Jaisalmer alive. Glowing in shades of yellow, Jaisalmer was founded in the 12th century by Rawal Jaisal of the Bhatti clan and is famous for its fort. It earned the name the Golden City from the yellow sandstone used to build the fort and houses of the Old Town, creating a golden glow over the town. Nearly 4,000 people still live in Jaisalmer Fort -- more than a quarter of Jaisalmer’s population. The second oldest fort in Rajasthan, Jaisalmer Fort is a UNESCO World Heritage site and along with seven others (Amer Fort in Jaipur, Chittor Fort in Chittorgarh, Kumbhalgarh Fort in Kumbhalgarh, Ranthambore Fort at Sawai Madhopur, Gagron Fort in Jhalawar, Mehrangarh Fort in Jodhpur and Jaigarh Fort in Jaipur), are collectively known as the Hill Forts of Rajasthan. The earliest settlement in the fort came up in the 17th century. The fort is built of yellow sandstone and the colour changes as the day progresses, from a light gold in the morning to a deep honey at sunset. Standing at the top of the fort, you get a view of the entire old town. There are 99 bastions and four fortified entrances. Inside the fort, you can see the Laxminath temple dedicated to the Hindu god of wealth Lakshmi and her consort Vishnu, ancient Jain temples and the traditional Rajput architecture of the Raj Mahal Palace. However, Jaisalmer is more than just a series of temples and palaces. This is a living fort, which nearly 4,000 people still call home. Its narrow alleyways are lined with shops, restaurants and guesthouses. Jaisalmer has a huge legacy of Jainism. Built in the traditional Dilwara architectural style, the fort houses seven Jain temples known for their art and intricate carvings. Remember that no photos are allowed inside the temples. For more on Jainism, visit the town of Lodhruva 15km from Jaisalmer. Here, you’ll find magnificent Jain temples dedicated to the 23rd tirthankar (Jain great teacher). Rebuilt in the 1970s after years of ruin, the temples still bear the scars of past battles. Look out for a pair of cobras who live in the compound -- seeing either is said to bring good luck. Towering over the main square of the fort is the seven storey Fort Palace Museum. Formerly the Raj Palace (Palace of Kings), the museum is home to the mirrored Rang Mahal, which is filled with paintings and sculptures from the 15th century. Most of the palace is open to visitors, allowing you to explore the small rooms and stooped walkways designed for spying on the outside world. Head to the top of the palace for views over the city. A man-made lake created right in the heart of the city, Gadisar Lake is surrounded by chattris (elaborate ornate tombs and cenotaphs), temples and stepwells. First created by Jaisalmer founder Raja Rawal Jaisal and then rebuilt by King Garisisar, the lake is a good spot to see migratory birds stopping for a drink. Ornate merchant mansions dot Jaisalmer and the most lavish and grand among them is the 19th century Patwon Ki Haveli. Now a museum, Patwon Ki Haveli is worth visiting for its architecture, intricate designs and history. The complex is a combination of five havelis and each is filled with stunning murals, mirror-work and paintings. The haveli belonged to merchant Guman Chand Patwa and his sons, who traded in gold, silver and brocade embroidery. There are also two other beautiful havelis worth visiting -- Nathmal Ki Haveli, which is guarded by two elephants carved in yellow sandstone, and the peacock-like grand roof of Salim Singh Ki Haveli. A trip to Jaisalmer is not complete without a camel ride in the sand dunes. Although there are several dunes around the city, the most popular is Sam Dunes, found 40km outside the city. Head there early morning or at sunset for great photographs. Khuri Dunes is another popular destination. This small museum tells the story of Rajasthan’s various princely states and explores the history behind traditional Rajasthani culture, including music and textiles. The centre hosts a nightly puppet show in English. Take the eerie trail to Kuldhara, an abandoned, haunted village 35km from Jaisalmer in the desert, to learn the tale of the 18th century Paliwal Brahmins. According to legend, the Paliwal were harassed by the local ruler who set his heart on one of the girls in the community. The Paliwal were given just a day to accept his proposal. Overcome by desperation, the entire community left their homes and escaped in the death of the night. Legend says that after several centuries, the Paliwal returned as ghosts to revisit their homes and the village is haunted. You can visit Kuldhara during the day to see the abandoned village and if you are curious, try braving it at night. The City of Lakes is undoubtedly the most romantic place in Rajasthan. Capital of the Mewar kingdom, Udaipur was founded in the 16th century by Maharana Udai Singh II, before becoming the capital of neighbouring Chittorgarh. Known for its palaces, this beautiful city is surrounded by seven lakes and the Aravalli range of mountains. There is something intrinsically romantic about Udaipur as you lose yourself in its lakes, palaces and gardens, so it’s no surprise the city is a sought after wedding destination. While there are seven lakes in and around the city, the most popular are Lake Pichola and Fateh Sagar Lake. Standing tall along the banks of Lake Pichola are a series of palaces stitched together -- all built in different eras starting from the 16th century. There are eleven individual palaces here, filling Udaipur’s skyline and forming the largest palace complex in Rajasthan. City Palace has several entrance gates known as pols, but you’ll most likely enter through Bara pol, which takes you into a courtyard and the triple-arched Tripolia gate. The courtyard is filled with eight marble toranas (arches), where kings weighed themselves in gold and silver before distributing the riches to their subjects. Constructed in a blend of Rajasthani and Mughal styles in granite and marble, the palaces reveal a network of halls, terraces, courtyards and towers. The main part of the complex is open as the City Palace Museum. Visit the miniatures at Kishan Vilas, which according to legend, was where Maharana Bhim Singh’s daughter Krishna Kumari drank poison to solve a dispute between suitors from Jaipur and Jodhpur over her marriage -- and thus saving the city from invasion. Head to the Sheesh Mahal (Palace of Mirrors) for art and intricate mirror-work, the Moti Mahal (Pearl Palace) for coloured glasswork, Mor Chowk (Peacock Courtyard) for mosaics and decorative peacocks and the Manak Mahal (Ruby Palace) for porcelain and crystal figurines. Shimmering white on Lake Pichola, the Lake Palace is a beautiful monument right on the water. Now a luxury hotel, Lake Palace was originally a royal summer palace called Jag Nivas. Entry is restricted to hotel guests, but take a cruise to view its marble edifice laced with semi precious stones. Lying adjacent to the Lake Palace is the Jag Mandir, another palace which sits as an island on the lake. It was used as a resort by royalty in the 17th century to host parties and is believed to be a source of inspiration for Mughal Emperor Shah Jahan when building the Taj Mahal -- he took refuge at Jag Mandir when he rebelled against his father Jehangir. The Jag Mandir is built over three storeys and architecturally blends Mughal and Rajput influences. Its entrance is guarded by a row of huge stone elephants, before giving way to the 17th century Gul Mahal tower and mosque, which has a small exhibit on the island’s history and great views over the lake. Another beautiful royal palace, the Monsoon Palace (Sajjan Garh Palace) sits atop the Aravalli Hills overlooking Fateh Sagar Lake. Built in the 19th century as a refuge from the annual monsoon, the palace was also used as a hunting lodge. Visit the palace in the evening for sunset views, or head here during the monsoon and watch the clouds float over Udaipur. A beautiful park filled with sculptures and statues, Saheliyon Ki Bari (Garden of Maidens) was created by Maharana Sangram Singh for his queen and her 48 female attendants as a refuge from court life. It’s now a popular meeting spot. Look out for the lotus pond and elephant fountains. Located at Gangaur Ghat on the banks of Lake Pichola, this 18th century palace belonged to the then prime minister of Mewar, Amar Chand Badwa. The Rajput architecture has been preserved and there is a museum dedicated to Mewar culture, including jewellery boxes, royal clothing and mural paintings. While Udaipur is a romantic city filled with magnificent palaces and sunset cruises, it is also known for its local arts and crafts, silverware and paintings. Visit the Bharatiya Lok Kala Mandal institution, dedicated to the region’s folk arts and crafts. Set up in 1952, the museum collects dresses, musical instruments, ornaments and other folkloric memorabilia. You can watch music performances and cultural shows here. Near the Fateh Sagar Lake is the Shilpagram, a cultural village dedicated to local crafts and a living museum, depicting the life and traditions of the folk artists.Hathi Pol bazaar, Bapu bazaar and Bada bazaar are the best places to buy jewellery, textiles and crafts. Chittorgarh is the capital of the historical Mewar kingdom and is easily accessible from Udaipur as a day trip. Yet another of Rajasthan’s UNESCO World Heritage sites, the town is synonymous with Meerabai, a princess who relinquished her royal status in an act of devotion to the Hindu god Krishna. Visit the temple named in her honour. Known as the Blue City, Rajasthan’s second largest city is dominated by the formidable 15th century Mehrangarh Fort. Palaces, citadels and cenotaphs set in lush gardens surround Jodhpur, but it is the iconic shade of blue that gives it its identity. For most, a visit to Jodhpur begins and ends with the towering Citadel of the Sun called the Mehrangarh Fort. Founded by King Rao Jodha of the Rathore clan, the 15th century fort is the symbol of the city, which tumbles down in vivid shades of blue below the fort. While Mehrangarh Fort and Umaid Bhawan Palace dominate the landscape of Jodhpur, it is fascinating to take a walk through the lanes of the Old City. The Old Market Square is dominated by a towering 19th century clock tower called the Ghanta Ghar. Soak in the atmosphere as you walk around the market, shopping for local shoes called Jodhpuri Mojari, trying street food or searching for Rajasthani textiles. Set in the Thar Desert, Jodhpur is a favourite destination for film-makers, with both Bollywood and Hollywood films filmed here. One of the largest and best maintained forts in India, Mehrangarh was built in 1459 by Rao Jodha, the founder of the Marwar Kingdom and the city of Jodhpur. Standing on a rocky outcrop, the fort is 410ft above the city, encircled by walls and surrounded by gates. There are several palaces, courtyards, temples and cannons inside the fort, which offers great views of the blue-clad city below. There are seven entrance gates, of which two -- Jayapol and Fattehpol -- were built by different rulers to commemorate their military victories. It’s about a 300m walk up through the hills to Mehrangarh from the Old City. If you’re feeling lazy, you can take an autorickshaw up the winding road. On entering, you’ll see the fort’s old entrance (Loha Pol) up ahead. Inside, look out for two sets of small handprints on the wall. These are the sati marks of royal widows, who committed ritual suicide on the funeral pyres of their husbands. The fort’s museum houses artefacts depicting royal life, with displays of weapons, costumes, art, paintings, palanquins and turbans. Don’t miss the Daulat Khana gallery, which houses a collection of Mughal period art and the Chamunda Mata temple, which is dedicated to the patron deity of the Rathore clan. The desert rock Rao Jodha Park, located at the foot of the fort, gives an introduction to the flora and fauna of desert life. One of the largest royal residences with 347 rooms, Umaid Bhawan is still a private residence to the royal kings of Jodhpur. Built in 1946, there are three parts to it -- the royal residence, a museum and a luxury hotel. Construction began in the 1920s when the city was going through a severe drought and the palace became a source of employment to many people. Located on the outskirts of the city atop Chittar Hill, the Palace is made of marble and golden sandstone in the Indo Deco style, with ornate rooms and grand courtyards. The museum displays some of the treasures of the royal family including a private collection of classic and antique cars. Drive a little distance from Mehrangarh Fort to see this marvel in white -- Jaswant Thada. A memorial built for King Jaswant II by his son Sardar Singh in 1899, it stands shrouded by trees and surrounded by gardens. The mausoleum is carved out of marble and was a burial site for the kings of Marwar. Look out for portraits of Rathore rulers and the odd memorial to a peacock that flew into a funeral pyre. The former capital of the Rathore clan lies in ruins amidst a beautiful garden filled with a fort, cenotaphs, temples, rock terraces and sculptures. Don’t miss the cenotaph of Maharaja Dhiraj Ajit Singh, which combines Jain and Buddhist architecture. This chattri also commemorates the ritual suicide of his 64 queens and concubines, who threw themselves on his funeral pyre in 1724. Located 9km from Jodhpur, visit for the Hall of Heroes (dedicated to folkloric characters), the Temple of Gods and the many monkeys roaming around. Rajasthan’s ‘other’ Blue City is known for its beautiful paintings tucked away in the Chitrashala, the art gallery inside the Bundi Palace. Less well-known compared to the other cities of Rajasthan, Bundi is a beautiful place full of unique architecture, such as the aptly-named Taragarh or Star Fort. The city’s place in literature is secured -- Bundi inspired Rudyard Kipling when he wrote Kim, with the author staying at the Sukh Mahal. Bundi is a historic place, with archaeologists finding several Stone Age tools dating back 200,000 years in 2017. There are also caves with rock art which are between 5,000-10,000 years old in and around the city. Originally founded by the Meena tribe, Bundi’s name comes from a chieftain called Bunda Meena. Bundi has some amazing viewing points, so head to the Taragarh Fort for a view over the city, before losing yourself in the art gallery at Chitrashala. If you’re after architecture, try Chaurasi Khambon ki Chhatri to admire the geometric precision of the 84 pillars of the cenotaph, or examine the artistry of Bundi’s 50 stepwells. This 14th century fortress’ name means the Starry Citadel, and this is a perfect place to do some stargazing on a clear night. The fort houses the Garb Gunjam cannon which rather curiously means The Thunder from the Womb. Although crumbling in places, the fort is worth the steep climb for its palaces, murals and views over Bundi. Watch out for the monkeys. Just below the Taragarh Fort stands Bundi Palace. The majestic Hathi Pol (Elephant Gate) greets you with its massive pillars, before heading inside to the Badal Mahal, Chhatra Mahal and Phool Mahal, each of which houses treasure troves of paintings. However, the palace’s biggest attraction is its group of turquoise and gold murals depicting historical battles and royal processions. The neighbouring Chitrashala Palace houses paintings commissioned by Rao Ummed Singh. Look for the images of Krishna, particularly the one of him playing a flute in the trees. Built along the banks of the Jait Sagar Lake in the 18th century during the reign of Ummed Singh, the Sukh Mahal was home to Kipling and inspired him to write Kim. Meaning the palace of bliss, the Sukh Mahal is home to Mughal art and statues, a marble cenotaph and gardens. Built in the 17th century by Rao Raja Anirudh for his foster brother Deva as a dome-shaped memorial, this cenotaph is famous for its 84 pillars (although legend says you can’t count them all). The cenotaph has several ornate sculptures and a linga (a form of Shiva) built in the centre. Stepwells are an architectural feature of Rajasthan and Gujarat. With water being a scarcity, stepwells were designed not only as sources of drinking water, but also places to bathe, pray and relax. Often sculpted as temples with gates, arches and pillars, there are about 50 stepwells in Bundi, but most of them are in ruins. The Raniji Ki Baori is the best known, built in the 17th century by Queen Nathavati, wife of Rao Raja Anirudh Singh. It is 46m (150ft) deep and each level has carvings of deities. Bundi is known for its miniature paintings and murals and there is a story behind them. In the 16th century when the Hadoti kings broke away from Mewar and befriended the Mughals, Emperor Akbar of the Mughals sent three artists from Chunar near Varanasi as “gifts” to the royal court. The artists shifted their canvas from palm leaf manuscripts to walls. Armed with a thin brush that had a single hair, they created the minute details of Bundi art that mixes Rajput and Mughal influences. To see the best of Bundi art, you must head to the Chitrashala, an art gallery tucked away in the Umed Bhavan, a part of the Bundi Palace. The entire gallery is a riot of colours with paintings depicting mythology, deities, temples and some beautiful and bold portraits of Rajasthani women. The colours are in vivid shades of turquoise and teal. There is even an Indian version of Romeo and Juliet.